Some 135 years after its discovery, Mars’ largest moon Phobos is seen in fantastic detail – and in 3D – in an image taken by ESA’s Mars Express spacecraft as it passed just 100 km by. This view is much different to the faint object that astronomer Asaph Hall would have just been able to make out as he observed the Red Planet through the United States Naval Observatory’s 66 cm telescope in 1877. Through this telescope he discovered Mars’ smaller, outermost moon Deimos on 12 August and the larger, innermost moon Phobos on 18 August. More than a century later later, spacecraft in orbit around Mars are studying Phobos in unprecedented detail. In this image, a bite-sized chunk appears to be missing from the right edge of the irregular shaped moon – this is a side-on view of the rim of large impact crater Stickney, so-called after the maiden name of the discoverer’s wife. Families of grooves appear to emanate from Stickney, carving channels across the approximately 27 km length of the moon. Initially thought to be associated with the Stickney impact crater, one recent theory suggests that they were instead formed when Phobos passed through debris clouds thrown up from the surface of Mars by asteroid impacts onto the planet’s surface. Orbiting Mars at just 6000 km from the planet’s surface, it is closer to its parent planet than any other known moon in our Solar System. The moon’s proximity means that it hurtles around Mars faster than the planet rotates: for an observer on the surface of Mars, Phobos would appear to rise and set twice a day. 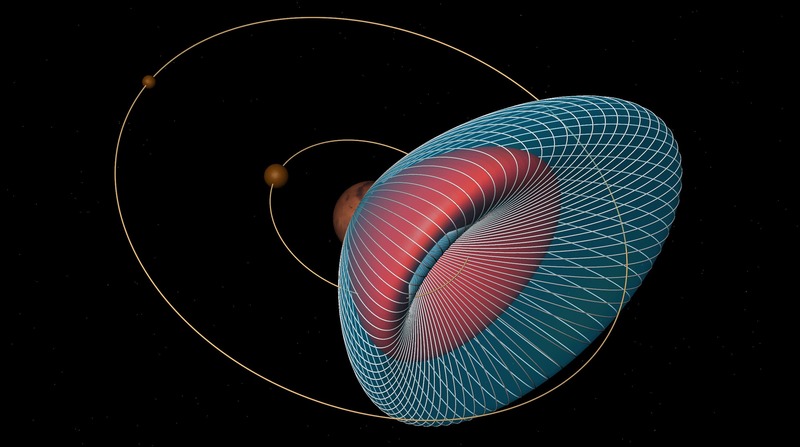 The moon’s orbit is decreasing and in some 50 million years time it will likely break up to form a debris ring around Mars, before colliding with the planet’s surface. Earlier this year, experts at Purdue University have suggested that a mission to Phobos could return with alien life.“A sample from Phobos, which is much easier to reach than the Red Planet itself, would almost surely contain Martian material blasted off from large asteroid impacts,” said Jay Melosh, a distinguished professor of earth, atmospheric and planetary sciences and physics and aerospace engineering at Purdue. Melosh led a team chosen by NASA’s Planetary Protection Office to evaluate if a sample from Phobos could contain enough recent material from Mars to include viable Martian organisms. The study was commissioned to prepare for the failed 2011 Russian Phobos-Grunt mission, but there is continued international interest in a Phobos mission, he said. It will likely be a recurring topic as NASA reformulates its Mars Exploration Program. Melosh collaborated with Kathleen Howell, the Hsu Lo Professor of Aeronautical and Astronautical Engineering, and graduate students Loic Chappaz and Mar Vaquero on the project. 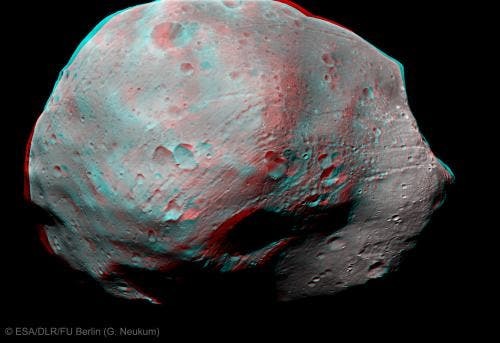 The researchers combined their expertise in impact cratering and orbital mechanics to determine how much material was displaced by particular asteroid impacts and whether individual particles would land on Phobos, the closer of the two Martian moons. The team concluded that a 200-gram sample scooped from the surface of Phobos could contain, on average, about one-tenth of a milligram of Mars surface material launched in the past 10 million years and 50 billion individual particles from Mars. The same sample could contain as much as 50 milligrams of Mars surface material from the past 3.5 billion years. When an asteroid hits the surface of a planet it ejects a cone-shaped spray of surface material, similar to the splash created when someone does a cannonball into a swimming pool. These massive impacts pulverize the surface material and scatter high-speed fragments. The team calculated that the bulk of the fragments from such a blast on Mars would be particles about one-thousandth of a millimeter in diameter, or 100 times smaller than a grain of sand, but similar in size to terrestrial bacteria. The team followed the possible paths the tiny particles could take as they were hurtled from the planet’s surface through space, examining possible speeds, angles of departure and orbital forces. The team plotted more than 10 million trajectories and evaluated which would intercept Phobos and where they might land on the moon during its eight-hour orbit around Mars. The probability of a particle landing on Phobos depends primarily on the power of the blast that launched it from the surface, Chappaz said. After the team submitted its report, scientists identified a large, nearly 60-kilometers-in-diameter crater on Mars. The crater, named Mojave, is estimated to be less than 5 million years old, and its existence suggests that there would be an even greater amount of Martian material on Phobos that could contain viable organisms than estimated, Melosh said. This possibility has been a consideration for some time, and Michael Crichton’s “The Andromeda Strain” brought it to public consciousness in 1969. However the movie scenario of a fatal contamination is unlikely, Melosh said. The image below shows the orbits of the Martian moons Phobos and Deimos and the spread of potential particle trajectories from an asteroid impact on Mars.